Business owners are always looking for new and effective strategies to grow their clientele. Online strategies like social media, search engine optimization, and email marketing are often exercised but may not drive the local attention anticipated by the owners. With the incredible reach of the Internet, it can sometimes be difficult to pinpoint cost effective methods to attract a more geographically targeted group. As a few of the most valuable Internet tools, placement in local online resources like Google Maps, Yelp, and Bing can drastically impact the online visibility of a business. Physical phone books are becoming a thing of the past and consumers are turning to the Web to find a local vendor offering what they need. Ranking number six in a list of the most used apps worldwide, Google Maps’ popularity proves that consumers are still demanding a way to visit physical business locations – especially restaurants and stores. Furthermore, review sites are also strong resources for peer-to-peer influences. With 44% of online reviews found on Yelp, businesses cannot afford to omit this platform in their online strategy. Rather, they should embrace its power and integrate these review feeds directly into all of their online properties, including professional websites and social media pages. 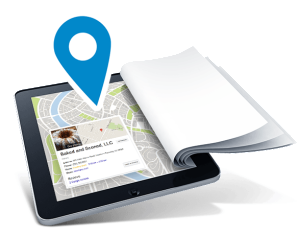 While these are just two examples, the vast array of mapping services, search engines, review sites and online directories offer capabilities beyond simple contact details listings. To do it right, owners will want to ensure they are promoting current sales, incorporating pictures of products or the facility, and keeping all contact details updated and consistent on each site. There are tools and services on the market to help business owners synchronize these efforts for optimal visibility and efficiency. If 60% of mobile searches result in a phone call, can your business run the risk of missing this great opportunity to drive sales? The below infographic showcases the impact that these online directories, apps, search engines, and mapping services have on not only a website’s traffic, but also foot traffic to physical locations.